At Home in Her Tomb: Lady Dai and the Ancient Chinese Trasures of Mawangdui. “For more than two thousand years, people had gazed across the plains at a pair of hills rising like a giant saddle from the earth,” begins Christine Liu-Perkins. These aren’t ordinary hills, but burial mounds of ancient royalty. But who? When the tomb was opened, scientists found the mummy of Lady Dai of Mawangdui. Her body was so well preserved that they were able to perform an autopsy on her, and learned that she died of a hear attack. They also found 138 muskmelon seeds in her digestive tract – remains from her last meal. 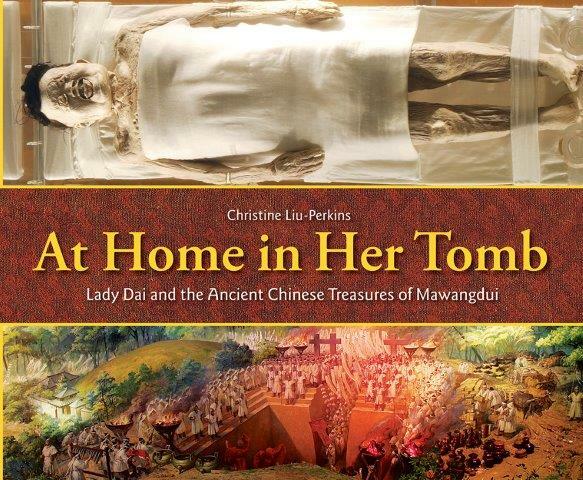 This book takes readers into the tomb of Lady Dai, along with the archeologists – and forensic scientists – who excavated the site. It’s filled with photos and drawings of the things she carried with her to the next life. There’s plenty of back matter for folks who want more: a timeline, glossary, author’s notes and sources. To learn more about this archeological treasure, and see photos and a video, check out this article. This will be a good title for feature in the 2015 KidLit Celebrates Women’s History Month. [http://kidlitwhm.blogspot.com] Thanks for pointing it out. That’s amazing that they could still do an autopsy and find out how she died. My daughter would be interested in reading this. I am definitely going to check this book out. It sounds absolutely fascinating. Thanks!